Specialist insurance provider AEGIS moved its document management to a solution based on Microsoft SharePoint® and MacroView DMF®. In this case study we look at key aspects of the project and why AEGIS users, management and the IT Department all feel that the move was a success. Associated Electric & Gas Insurance Services Limited (AEGIS) began operations in 1975. Today AEGIS offers a full range of sophisticated insurance and risk management products and services to member companies of the utility and related energy industry. AEGIS offers its members general liability, directors and officers liability and property coverage. Headquartered in East Rutherford, NJ, AEGIS also has international capabilities through Syndicate 1225 at Lloyd’s of London. Total user count is approximately 300. In mid-2011 AEGIS started a project to replace an existing document management system with a solution based on SharePoint 2010. The objective for the project was to reduce IT operational costs by rationalizing onto the SharePoint platform. The legacy system provided a number of features that were popular with users. One such feature was the ability to drag and drop to save emails and attachments while working in Microsoft Outlook®. Another was the ability to associate each document with a number of related Policies and Claims. The legacy system was also integrated with existing Line-of-Business systems and was managing a reasonably large volume of documents. Shadow Documents – as a document was saved or deleted, Link-To-Document type entries were automatically created in the folders corresponding to related claims – thereby retaining a key feature of the legacy system for AEGIS users. Metadata-based security – custom event receivers were used to set documentlevel permissions based on the value of metadata columns. Sticky Views – MacroView DMF already remembered the library view that you used most recently in Microsoft Outlook. AEGIS had this extended to other applications. The SharePoint server farm installed to run the new document management environment had 24GB main memory, 8 CPUs and separate SQL Server and FAST server. Native FileStream Remote Blob Storage was configured so that almost all documents were stored on external file servers. For the users, AEGIS provisioned a virtual desktop that runs Microsoft Windows® XP and Microsoft Office 2010. The migration was staged by department. AEGIS used a combination of third-party and in-house code to perform an initial bulk migration, followed by a period of parallel operation, with subsequent migration of deltas. In all, around 800GB of documents and metadata was migrated. A significant aspect of this migration was the mapping of the legacy system’s metadata to the metadata supported by SharePoint. Folderlevel defaults were used extensively to implement automatic metadata. 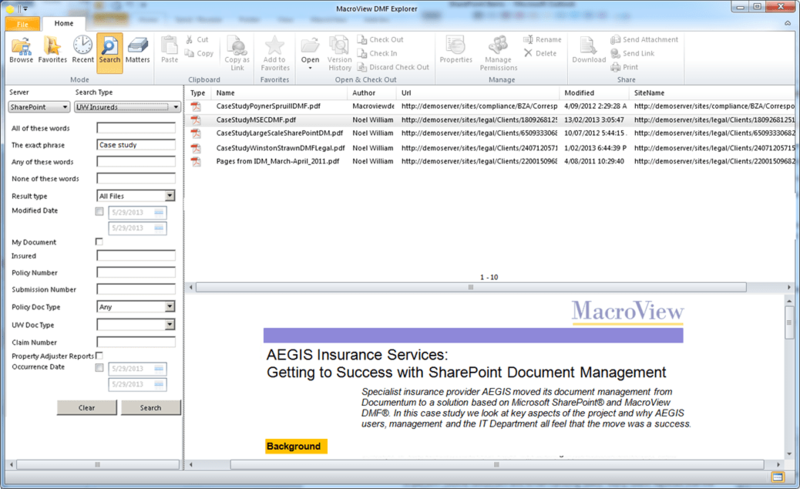 Reaction from AEGIS users to the new SharePoint + MacroView DMF document management solution has been positive. The new solution continues to provide the DM functionality and security features that they relied on in the previous DM environment. Importantly, the new SharePoint-based solution has good performance – on average less than two seconds to perform a search or to save a document. And thanks to MacroView DMF the business users can still save, search for and retrieve documents and emails while they work in familiar applications such as Outlook, Word and Excel. Users particularly like the Favorites feature of MacroView DMF. This enables oneclick navigation to frequently-used areas of the SharePoint environment. For example, a user can drag and drop to a Favorite folder to save emails or attachments for a Policy or Claim that they are administering. 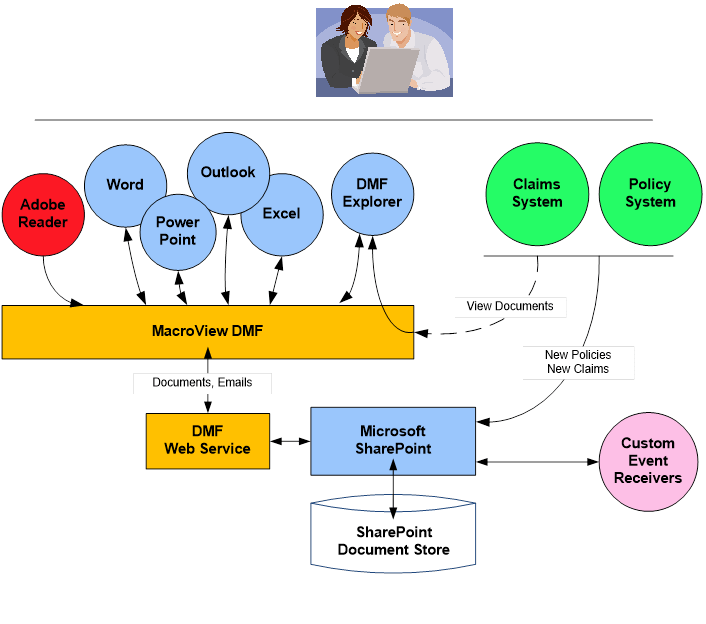 AEGIS commissioned MacroView to configure the Push Favorites mechanism of MacroView DMF, which automatically creates Favorites for each user, based on the Policies and Claims that they (or their selected colleagues) are associated with in the line-of-business Policy and Claims administration systems. MacroView DMF Explorer running in Favorites mode. Note groups for My Claims and My Policies. From the perspective of AEGIS Management, the move to SharePoint-based document management has been a real success. The project enabled the retirement of an old platform and reduced the number of applications, which provided a major saving in terms of software license fees and operational costs. In addition, the staged migration to the new DM facilities went smoothly – there was minimal disruption to ongoing business operations. The way the new solution maintained functionality and provided a broadly similar look and feel were vital in this regard, because they minimized the amount of user re-training that was required. Best of all, the project to move DM to SharePoint was completed on-schedule and ahead of budget. Searching in MacroView DMF Explorer using custom AEGIS Underwriting Search panel.